I need to say that you still hold the accolade of being the the best turkey producer I know! 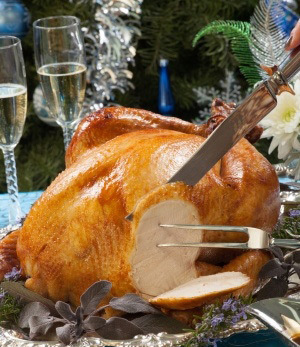 Your bronze turkey was absolutely perfect, very tasty and succulent; the 6kg bird fed 12 of us for 2 days with not a scrap left over – thanks again. Many thanks once again for the delicious turkeys you supplied us with this Christmas. Bought another turkey from you last year and it was brilliant! Buying another this year and every year as they taste so good. Philip and Alastair Turkeys are simply the best! Turkey was delicious! Thank you. Many thanks poultry superb again. We have had some wonderful compliments from our customers re turkeys – well done – another fantastic year!! Thank you so much – the turkeys were delicious. Please thank the team for two excellent turkeys, received from you for the first time. They were delicious. I look forward to repeating the order next year. Thank you for supplying me with the most delicious turkey, gammon, bacon and sausages again. Just wanted to say how much we enjoyed our turkey we bought from you. All the family commented on how lovely it was. The piece of gammon was also good. Thank you for all the hard work involved. Just a quick note to say thank you for a very delicious “bird”. It went down a treat!